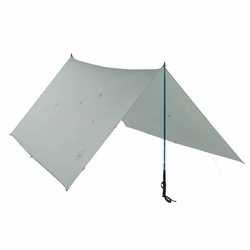 Big Agnes Onyx UL Tarp. With more options than a Swiss Army knife, this is the go-to tarp for the thru-hiker, minimalist, or ultralight connoisseur. Barely weighing more than your key chain, this easy to use tarp can be set up in multiple configurations. The Onyx can be tied over a hammock, pitched over a sleeping bag, erected over a kitchen snow pit, or used as an emergency rain shelter over your raft and can be stowed away in the smallest of spaces.